Rolled Alloys was founded on the introduction of wrought RA330 alloy as a replacement for cast HT alloy in the commercial heat treat industry. Since this introduction in 1953, the company has enjoyed continuous growth through the expansion of alloys offered, markets served, customer base, geographic growth, and acquisitions. Our west coast facility, Harvey Titanium, now includes inventory of nickel base alloys and specialty stainless steels. All five U.S. locations export products around the world; our products are also available through Rolled Alloys divisions in Canada, Europe, Singapore and China. Rolled Alloys continues to be one of the most respected specialty metals suppliers worldwide. Rolled Alloys is committed to quality service for our customers. The hallmark of our success has been superior customer service, with a staff of salespeople, metallurgists, and quality control professionals to support our customer's needs. We stock a large variety of alloys and have extensive processing capabilities, both of which enable us to provide prompt shipment of stock size material and custom cut parts. 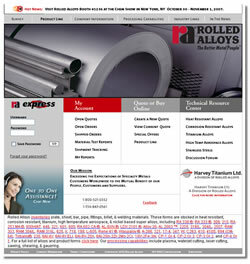 Rolled Alloys is a technically focused organization. Today, a staff of degreed engineers provides our customers with technical expertise in a broad range of applications, helping solve customer's problems on a daily basis. Our extensive laboratory capabilities permit material evaluations, including selective destructive testing.